I've been watching fall advance locally: first the red of the Dogwoods, the yellow of the Locusts, the psychedelia of the White Ash. When my system gets back up and running, I'll have some photos of my own to share. Meanwhile, NASA treats us with their annual satellite perspective on the phenomenon. This is how it looked about two weeks ago. 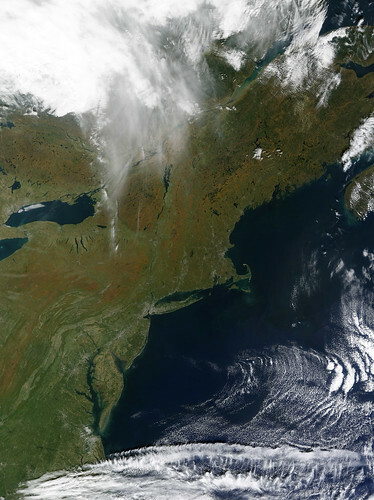 Fall was beginning to color the East Coast of the United States when the Moderate Resolution Imaging Spectroradiometer (MODIS) on NASA’s Terra satellite captured this image on October 12, 2008. Orange touches trees in the north and at higher elevations, where temperatures are cooler. Lower elevations are still green. The fall color follows the sweep of the Appalachian Mountains through Pennsylvania, New York, and into New England. The image also illustrates the dense population of the East Coast. Cities are gray in this photo-like image. The greater New York City region covers a large area on the coast. Boston, Massachusetts, and Providence, Rhode Island are also clearly visible. 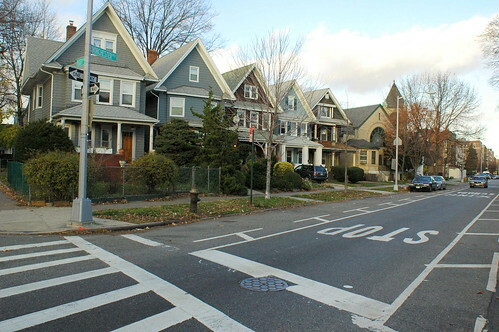 We turn our attentions to Ditmas Park, one of the three Flatbush historic districts that feature beautiful Victorian houses and a low-key, family-friendly vibe. We spoke with Ben and Liena of Ditmas Park Blog for their takes on one of Brooklyn’s best-kept secrets, and how it is also in a state of change. Are we really such a secret, anymore? 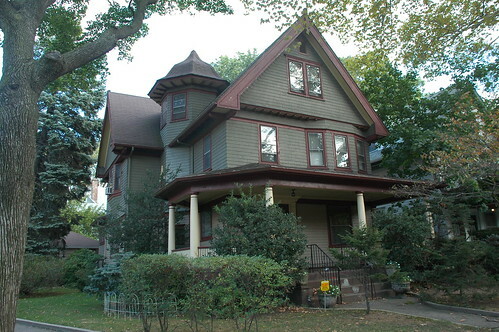 Victorian Flatbush was featured in This Old House, for the gods' sakes, over the summer as the best place in the U.S. to buy an old house in an urban area. Fiske Terrace-Midwood Park, which is one district comprising two adjacent neighborhoods. 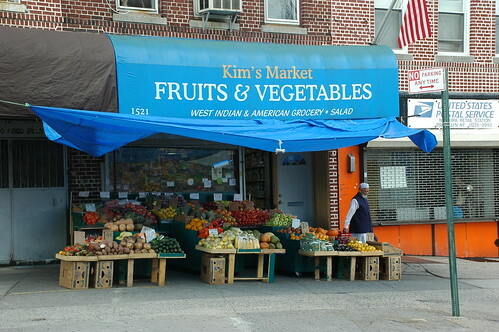 Only one of my three photos is from Ditmas Park: a photo of a vegetable stand on Newkirk Avenue. I'm not providing any links to LifeStyler's Web site. Why should I? They didn't link to any of their folks whose creative content they ripped off. ... we are experiencing technical difficulties. Specifically, the graphics card on my Dell laptop is shot. And, with their stellar support, which I already paid for, I get to wait 3-5 BUSINESS days for a replacement part. So posting from the FG is going to be slim for the next two weeks. 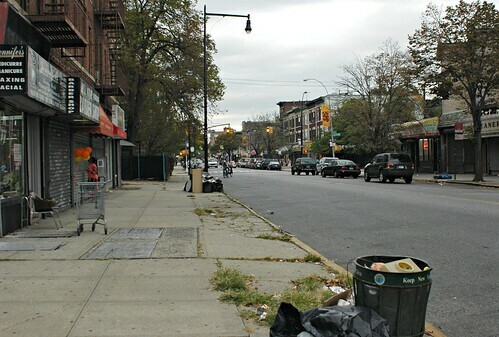 Cortelyou Road, North side, looking East from Westminster Road, September 2006, before the new streetscape was put in place in Spring of 2007. Twenty some years ago my husband, 2 young sons and I moved from our cramped 16-foot wide attached row house in Brooklyn’s trendy Park Slope to a free-standing, 7-bedroom Victorian house in the Ditmas Park section of Flatbush with stained glass windows, pocket doors, original wood paneling, a back yard, front porch, driveway and 2-car garage in a little-known, tree-lined neighborhood about 10 minutes away – on the other, high-crime side of Prospect Park. I know everyone's tired of hearing it from me, but this is not Ditmas Park. It's Beverley Square West and Ditmas Park West. Or Victorian Flatbush. Or just plain Flatbush. I suspect the editors provided the title, not Jan.
Little changed even after the extraordinary Giuliani/Bratton efforts brought down crime, little changed in the mid-1990s. The district’s once thriving shopping street, Cortelyou Road , still had no bank, no coffee shop, no diner, no sit-down restaurant, no children's store, no real estate office. 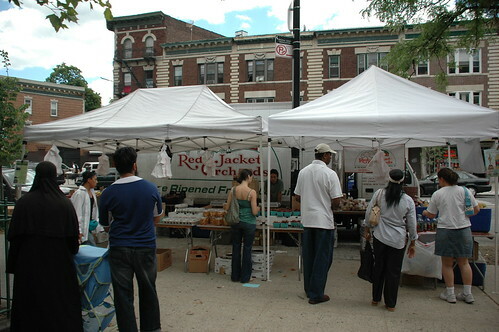 Although Jan doesn't mention it in her article, the transformation of the Cortelyou Road streetscape resulted from many years of organizing and planning from several different sources, including the Flatbush Development Corporation (FDC). FDC has been active since arson for insurance fraud was a serious concern for the neighborhood, unthinkable today, when the same homes that might have been torched 20 years ago are going for over $1 million. FDC sponsors the annual Flatbush Frolic, which takes place on Cortelyou Road, and has been running for 31 years. 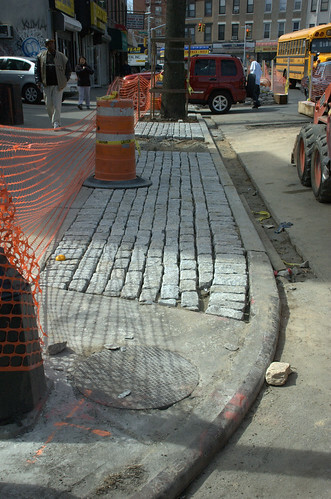 Cobblestones, Cortelyou Road, South side, West of Stratford Road, march 2007. That's Coney Island Avenue in the background. 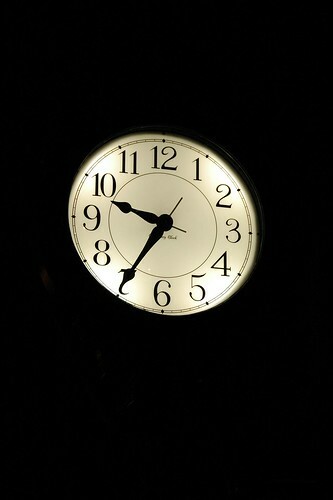 The new clock at night, in April 2008, shortly after it was installed this Spring, on the grounds of P.S. 139 at the corner of Rugby Road. Even before we moved into the neighborhood, James Heaton's Flatbush Residents Email Network Database - FREND - served as an introduction to the cultural landscape and issues of the neighborhood we were adopting. The on-line contribution really blossomed in 2003 when Ellen Moncure and Joe Wong revived the Flatbush Family Network (FFN) . This site has become an invaluable source of neighborhood and childrearing information for the many young families who live here. For many people moving into this neighborhood, FFN provides an initial introduction and orientation to life in this neighborhood. For those who live here, it’s a convenient, ongoing source of information and support. 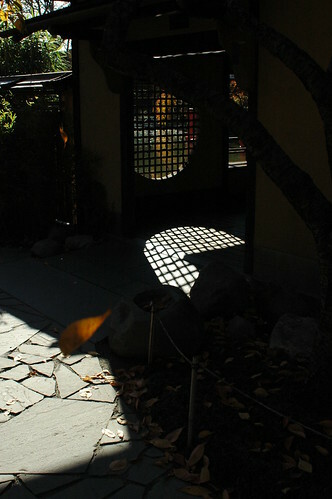 Cherry leaves falling at the entrance to the Viewing Pavilion, Japanese Hill-and-Pond Garden, Brooklyn Botanic Garden, November 2006. Autumn is upon us, and the leaves are already starting to turn at BBG. Come document the change in foliage and then submit your photos to our Flickr Fall Foliage Contest! Photos must be of fall foliage, but you are not limited in format—close-ups, macros, wide-angle shots, landscape images—it's all fair game! Photos must be taken at BBG this year, between Monday, October 13 and Sunday, November 30. Each week the Garden's web staff will select a favorite image from the group to feature on our homepage and award the photographer with 2 free passes to BBG. All submitted photographs will be featured in a slideshow on the site as well. It's easy! 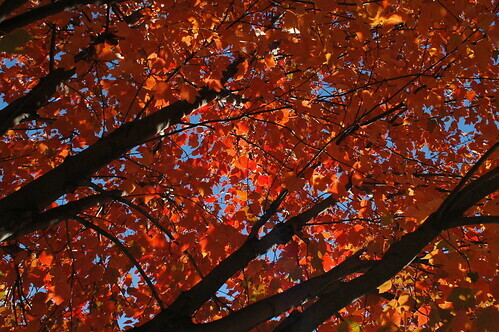 Just add your photos to our Fall Foliage Flickr group and we'll do the rest! Not much advance notice, but I just learned of this myself. The only Brooklyn giveaway date and location this season is this Saturday, October 18, in Sunset Park. 1,250 FREE trees will be available for adoption by homeowners and community groups at select locations throughout the five boroughs this October. Trees will be distributed by New York Restoration Project (NYRP). 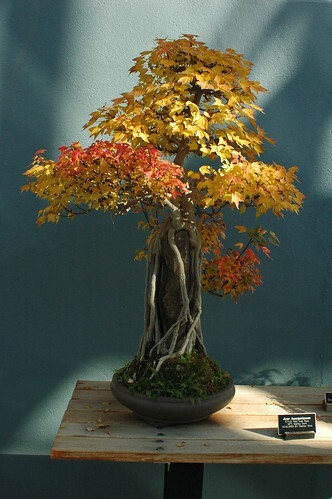 Note – individuals and families are limited to adopting one tree per household; and all tree recipients are required to register their new tree at www.milliontreesnyc.org. Interested community groups that can plant and care for 5-10 trees should contact mcrowley@nyrp.org before October 18th. For residents who do not have their own yard to plant a tree, information on volunteering, educational programming and contributing to MillionTreesNYC will also be available. 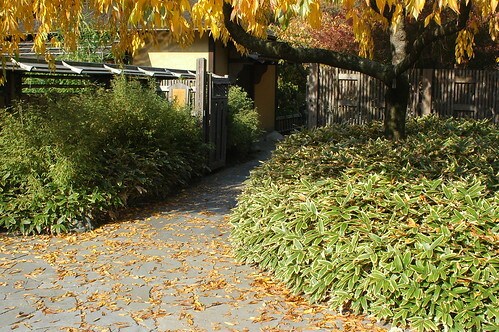 A variety of trees of different sizes, including flowering and medium and large canopy (shade) trees will be available. Our horticultural staff will be present to provide advice on which species tree is best for your home. I'm curious to know what kinds of trees are available. I'm planning to plant two native trees in my backyard to replace the failing, weedy maples which I've had to get removed over the years. 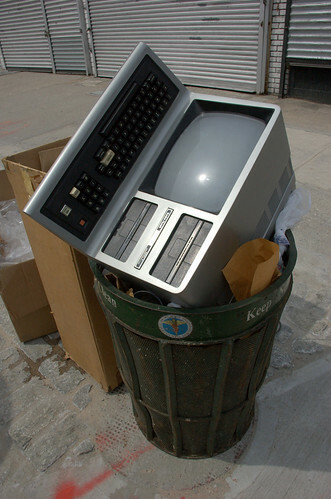 This giveaway conflicts with the Daffodil Project pickup, which is also this Saturday, in Grand Army Plaza. Earlier today, the Brooklyn Blogade, a semi-regular gathering of Brooklyn bloggers from across Brooklyn, met at the Brooklyn Botanic Garden. 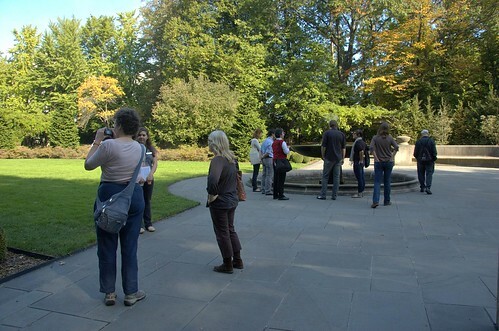 We had perfect weather for the outdoor portions of our visit, which included schmoozing in BBG's open-air Terrace Cafe and a guided tour of some of the Garden. During the indoor session, we had presentations from BBG staff and free-wheeling Q&A about the online face of BBG: where it came from, where it is today, and where it could go. and, of course, the hosts for today's event, the Brooklyn Botanic Garden and Flatbush Gardener. From 11am on, we gradually assembled in the Terrace Cafe. Folks had a chance to get something to eat, sit around, make introductions, chat, and so on. We greeted friends and made new acquaintances. 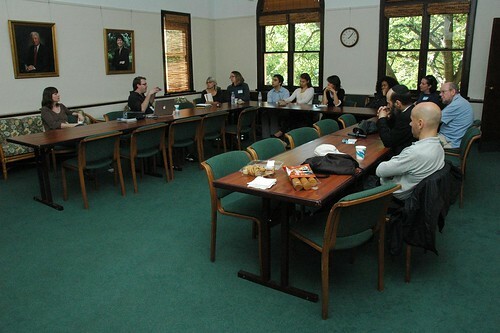 Shortly after noon, we moved to the Member's Room, seen in the photo at the top of this post. I briefly explained the agenda for the rest of the day, then turned it over to our hosts from BBG. 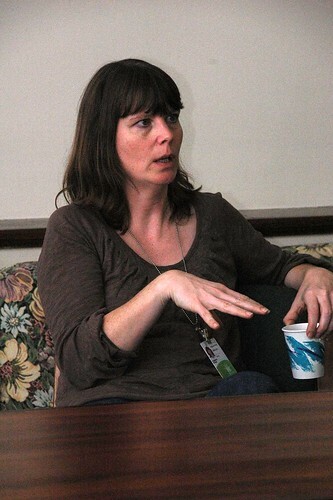 Elizabeth Peters, BBG's Director of Publications, was first up. 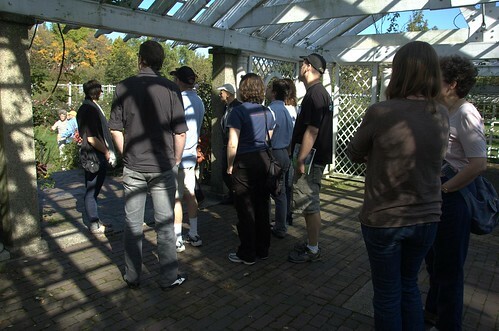 She provided a brief history of the Garden, from its founding and opening to the public in 1910 and 1911 to the present. BBG's centennial is just two years away. BBG hopes to have a new Visitor's Center ready for that. The new Center will transform the northwest corner of the Garden, where they share a parking lot with the Brooklyn Museum, and open it up to Washington Avenue. This rendering, from BBG's 2007 Annual Report, depicts how the new Center will appear from the Cherry Walk inside the garden, looking northwest toward the new entrance on Washington Avenue. The Overlook, with its allee of mature Ginkgo trees, is to the left. Although construction will require permanent removal of four Ginkgos, one will be transplanted elsewhere in the Garden - a project in itself - and the other three will have their lumber put to use in the Visitor's Center. Test beds for the green roof in the building are already planted out along the Overlook, in roughly the location the building will occupy. We saw these during the guided tour for the Blogade. 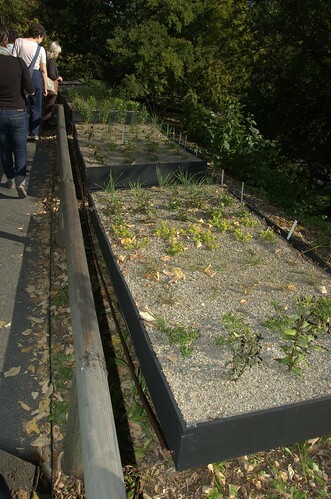 The roof will be a meadow of what looked to be mostly, if not entirely, native plant species and cultivars. The Visitor Center will be BBG's first "green" building and will be part of an unfolding series of future projects, including new gardens and improvements to public entrances. Constructed to meet rigorous Leadership in Energy and Environmental Design (LEED) Green Building certification standards, the Visitor Center will feature such environmental elements as a living roof, use of recycled building materials, passive solar principles, geothermal heating, and bioswales (recessed catchment zones filled with water-loving plants) that will improve storm water management and relieve the burden on the municipal sewer system. It will house an exquisite new garden shop, a much-needed orientation room for tours and classes, an information desk, a dramatic event space, a refreshment bar, and other visitor amenities. 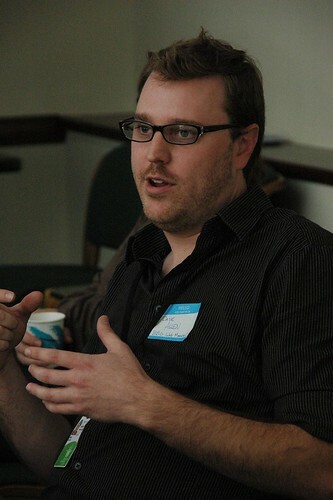 Dave Allen, BBG's Web Manager, spoke next. The integrity of the information available through BBG is an important aspect of BBG's educational mission. Dave spoke of the challenges to opening up BBG's online presence, while retaining its "authoritative" voice. We're just seeing the beginnings of BBG's online transformation, one that will parallel transformation on the grounds. They experimented two years ago, during the historic bloom of BBG's Titan Arum, "Baby." They published the online journal of Allesandro Chiari, BBG's Director of Propagation, as he tracked the growth, peak, and death of the bloom. They even published some visitor content on their Web site: some of my photos of "Baby" on my final visit, just after peak bloom, and in the early stages of decline before collapse. BBG's current Web site is static pages, "authoritative" in content and tone, and closed to more personal observations. Development is already underway on BBG's next generation Web site - call it "BBG.org 2.0" - which will incorporate more dynamic content, personal observations of BBG staff, and more. Following the lively discussion about BBG and its online efforts, we did the round-robin "Shout-out" where each of us introduced ourselves and our blogs, and had a chance to share our interests. After the Shout-out, there was time for coffee, cookies, and more schmoozing before our tour guides joined us and took us out onto the grounds. Our primary guide, Christina, was a good sport. 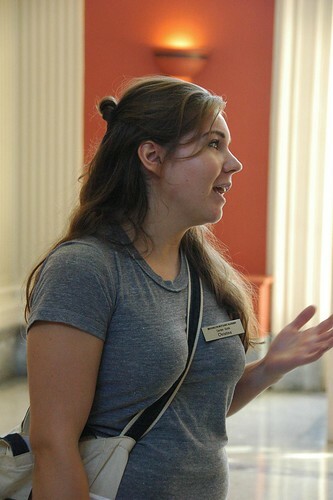 Not only did she have three BBG staffers and another guide on her tour, there was a past BBG tour guide, and a pedantic garden blogger to contend with. Nevertheless, the tour was enjoyed by all, and I hope Christina was able to tolerate our company as much as we enjoyed hers. ... and viewing the knot garden in BBG's Herb Garden. This may be the last year for the knot garden. This is right where the new Visitor's Center and entrance will be located. The entire Herb Garden will be recreated near the southern end of the garden, along Flatbush Avenue. Elegant and sketchy, welcoming and insular, the striated band of roadway, trees and people called Ocean Parkway both reflects Brooklyn and divides it with a thick green line. It was designed about a century and a half ago as a place to promenade, to socialize, to pleasure-drive or to settle, on a street that looks like a park. The architects Frederick Law Olmsted and Calvert Vaux were inspired by the grand tree-lined boulevards of Europe, like Avenue Foch in Paris and Unter den Linden in Berlin. Ocean Parkway held the first bike path in the country ... in 1894. Its northernmost extent was lost to the Robert Moses' Prospect Expressway in the 1950s. While it once extended to Prospect Park, at Park Circle, it now ends at Church Avenue. The City designated Ocean Parkway a scenic landmark in 1975. Today, the Parkway is managed in part by the Parks Department. Five and a half miles long, it stretches from Prospect Park to Brooklyn’s beaches at Coney Island. The parkway is divided according to function. The center lane is only for private vehicles, and was intended for pleasure driving, originally for horse-drawn carriages. It is flanked by two greenswards, planted with trees and grass, which lend the road a park-like atmosphere and provide a place for pedestrians to stroll. Outside the greenswards are service roads for local and commercial traffic. 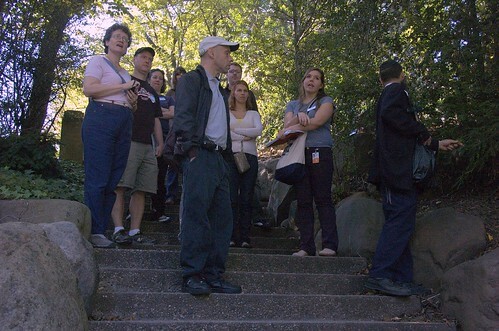 Only two days before this Sunday's Brooklyn Blogade at the Brooklyn Botanic Garden. The weather's looking perfect: sunny, in the mid-70s. We're going to have a good turnout. If you previously RSVPd, and did NOT receive a confirmation email this morning, please forward a fresh copy of your original email to the Blogade RSVP email address given below. * BBG is offering free admission - and parking - to those attending the Blogade. * Space in the Member's Room is limited. * For free admission, please provide your real name. * RSVPs will be fulfilled first-come, first-served. 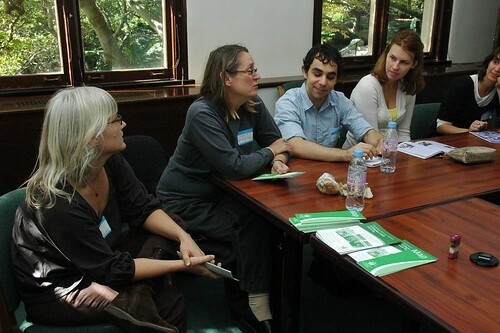 This is a reminder that the next Brooklyn Blogade is this Sunday, October 12. Our location this month is seasonally appropriate: the Brooklyn Botanic Garden. There are still seats available, but RSVP is required. See the original post for details. NYC's Department of City Planning (DCP) provided the first view of their revised draft of the Flatbush Rezoning Proposal to Brooklyn's Community Board 14 (CB14) on September 3, and more recently to the CB14 Executive Committee on September 18. I wasn't able to sit in on any of the meetings, but I've spoken with folks who've seen the new proposal first hand. After a presentation to the executive committee of Community Board 14 – which greeted the plan warmly – the Department of City Planning (DCP) is moving forward to certify the proposal, which will launch the formal approval process for the rezoning. During the meeting, which was held in the board office, 810 East 16th Street, DCP received accolades from board members and area residents for reworking the plan to take into account neighborhood concerns. They really listened to the concerns of residents, went back and re-drafted to address them. The free-standing homes responsible for the physical character of this area of Flatbush will be protected. All of Flatbush will be protected against unlimited height residential development. There are new opportunities for commercial development, and incentives for affordable housing. It's hard to find something to critique in this draft.